Whether it’s cycling through the pastoral trails of Motutapu or making the tough climb up the 600-year old volcano on Rangitoto, this event will have something to make the trip to the Islands unforgettable for everyone involved. New Zealands catalogue of natural wonders is considerable, but the Hauraki Gulf Islands certainly rank highly among them. Join us for a choose-your-own adventure event including a triathlon, mountain biking, trail running, and even a walk on the stunning Motutapu and Rangitoto Islands. In addition to assisting a good cause by donating part of your entry fee to help preserve the unique arboreal environment of Motutapu Island, the Partners Life DUAL is the only organised sports event of the year on the islands. Something this good cant last, unfortunately, as tickets for the event are limited, so dont wait - sign up today! We will have a collection of prizes to give out (thanks to our amazing sponsors and partners), and an awesome line-up of bands to keep you entertained in the sun with a beer or glass of wine! 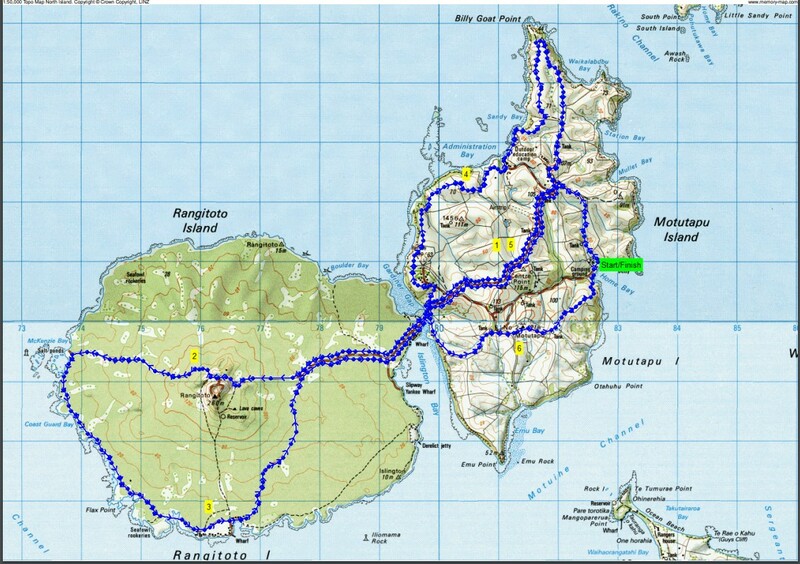 The first stage of the marathon is set on Motutapu Island, with a steady uphill from Home Bay. You can distract yourself (and your legs) with a view over Auckland City as well as many of the other, nearby islands during the climb. You’ll have to make more than 1,000 metres of vertical ascent during the race, so get used to it! From there, you will make your way to Emu Point (at the south end of the island) via a beautifully pastoral stretch of land that takes you all the way to the bridge to Rangitoto Island. If you’re an out-of-towner, you’ll be pleasantly surprised to note that this climb is a bit more fiery than most you’re used to – Rangitoto is a volcano! After going around the edge of the crater (and the Lava Caves just below it), the trail will take you straight down towards the shoreline. 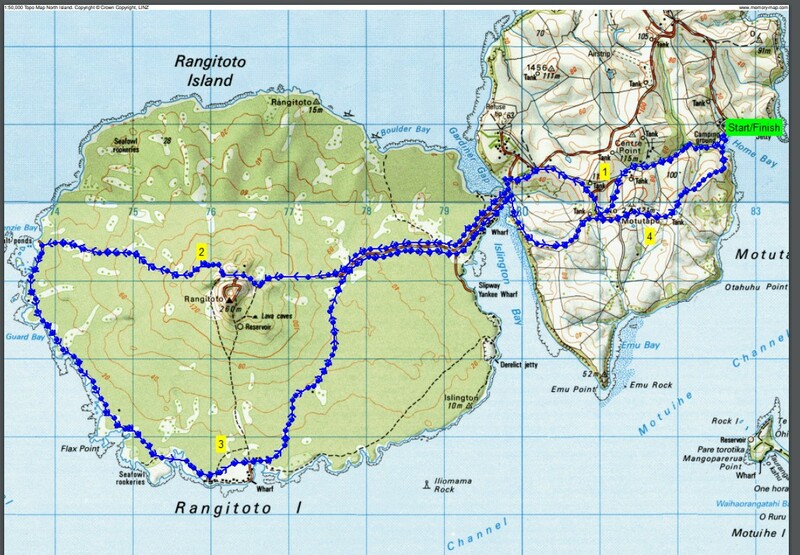 The route stretches across the Pohutukawa Forest before taking you back through the lava fields by the shore. Congratulations, you’re halfway! Now, taking the opposite route around Motatupu Island, you’ll follow the coastline past some World War Two-era military fortifications in the northwest and descend back towards where you began, in Home Bay. Finally, you’ll go over the hill back toward the road before beginning a final descent down to the finish. For the half marathon, you’ll begin your journey on Rangitoto Island, where you’ll encounter the island’s unique arbors and lava fields. From there, you’ll have to grind your way up the volcano that gives the island its name, and once you reach the top, you’ll be rewarded with a trek across the beautiful Pohutukawa Forest that will get you back to the coast. The path along the shore is a more tropical, jungle terrain that will guide you all the way on your return to Motutapu. There, you’ll encounter lush farmland on your climb to the Island’s highest point, after which you will have ascended more than 500 metres in total over the course of the race! The last stretch of the race is a steady downhill all the way back to where you started, at Home Bay. The Half Marathon sold out completely last year, so get your ticket while it's hot! You’ll begin your journey at Home Bay on Motatupu Island, from where you’ll go uphill for a bit on a gravel road. The trails from the top will lead you across gently down-sloping grassland with a great view of the rest of the island. After you reach the base, you’ll go back uphill on the island’s primary road, and, after potentially stopping at the aid station located at the peak of your climb, you can head southward across a pastoral stretch of the island. Finally, you’ll clamber over one final hill before reaching the all-downhill home stretch. The 10 km has sold out the past few years, so get your tickets while they’re hot! After you reach the base, you’ll go back uphill on the island’s primary road, and, after enjoying the gorgeous views at the peak of your climb, you can head downhill to the finish line. 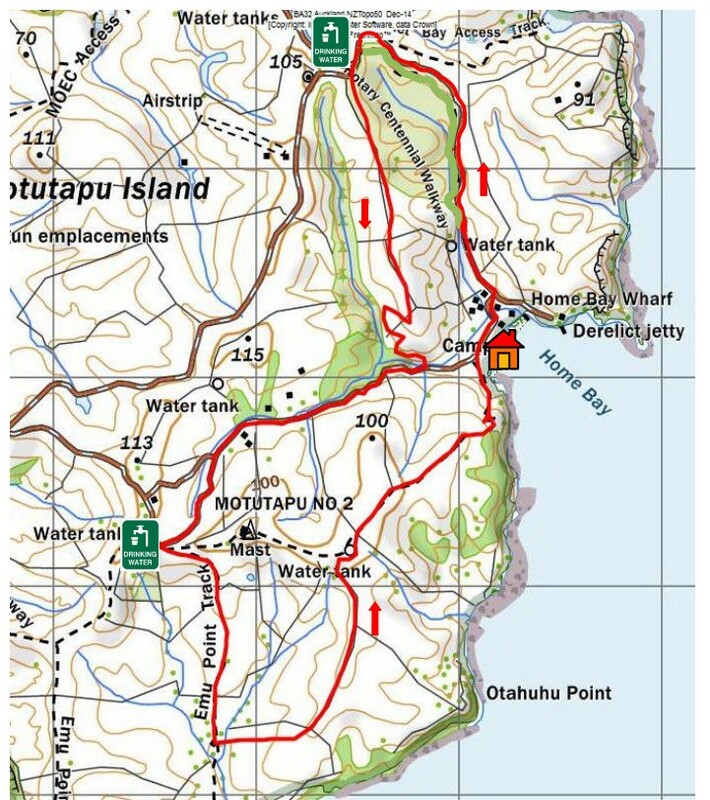 The first stage of the race is set on Motutapu Island, with a steady uphill from Home Bay. You can distract yourself (and your legs) with a view over Auckland City as well as many of the other, nearby islands during the climb. From there, you will make your way to Emu Point (at the south end of the island) via a beautifully pastoral stretch of land that takes you all the way to the bridge to Rangitoto Island. If you’re an out-of-towner, you’ll be pleasantly surprised to note that this climb is a bit more fiery than most you’re used to – Rangitoto is a volcano! After that, you’ll head down the other side of the volcano back towards Motutapu. 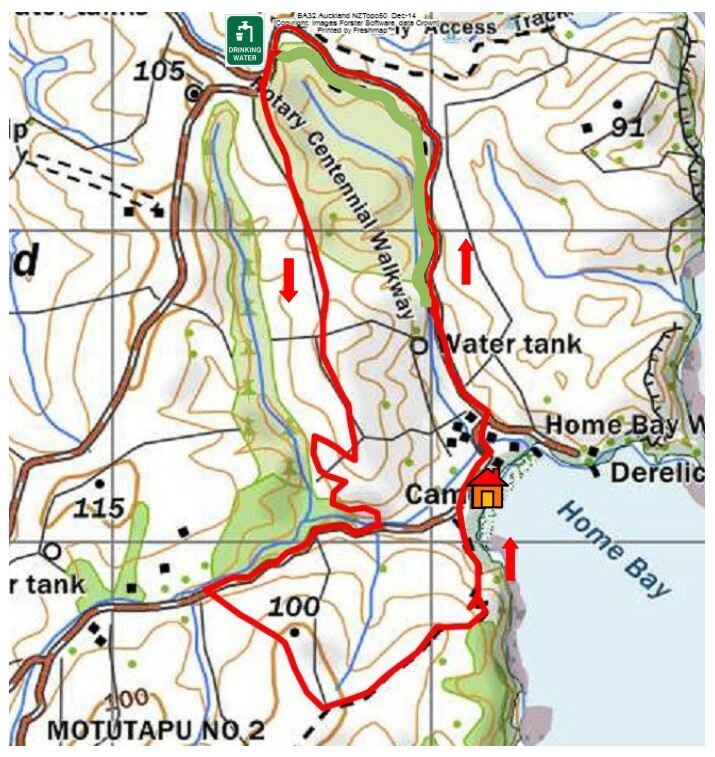 This will be a fast, 10 km descent, so enjoy it, but not too much to enjoy the Pohutukawa trees as you pass by. Now, taking the opposite route around Motatupu Island, you’ll follow the coastline past some World War Two-era military fortifications in the northwest and descend back down the central road towards where you began. The last stretch will involve making a left onto some lush farmland, before you race down the 2 km descent to the finish at Home Bay. From there, you will make your way to the bridge to Rangitoto Island. If you’re an out-of-towner, you’ll be pleasantly surprised to note that this climb is a bit more fiery than most you’re used to – Rangitoto is a volcano! After that, you’ll head down the other side of the volcano back towards Motutapu. 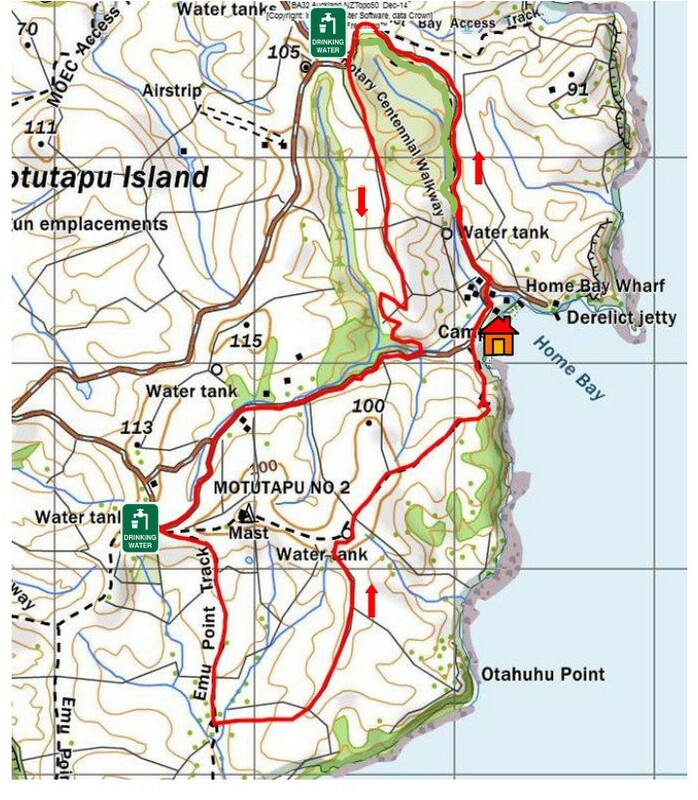 This will be a fast, 10 km descent, so enjoy it, but not too much to enjoy the Pohutukawa trees as you pass by. Now, taking the opposite route around Motatupu Island, you’ll make a left onto some lush farmland and climb to the island’s highest point before you race down the 2 km descent to the finish at Home Bay. The first leg of the triathlon will be a swim in the southern end of Home Bay, consisting of two 500m laps. After getting out of the water, you’ll go straight onto your mountain bike. 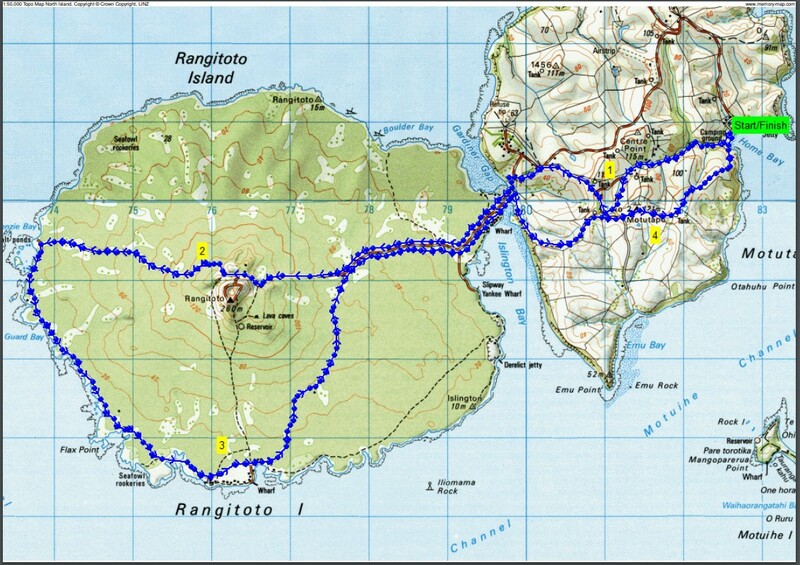 The first stage of the cycling race is set on Motutapu Island, with a steady uphill from Home Bay. You can distract yourself (and your legs) with a view over Auckland City as well as many of the other, nearby islands during the climb. From there, you will make your way to the bridge to Rangitoto Island. If you’re an out-of-towner, you’ll be pleasantly surprised to note that this climb is a bit more fiery than most you’re used to – Rangitoto is a volcano! After that, you’ll head down the other side of the volcano back towards Motutapu. This will be a fast, 10 km descent, so enjoy it, but not too much to glance at the Pohutukawa trees as you pass by. Once you cross over, taking the opposite route around Motatupu Island, you’ll make a left onto some lush farmland and climb to the island’s highest point before you race down the 2 km descent to Home Bay. Now, you’ll begin the final leg of your journey by going uphill for a bit on a gravel road. The trails from the top will lead you across gently down-sloping grassland with a great view of the rest of the island. After you reach the base, you’ll go back uphill on the island’s primary road, and, after potentially stopping at the aid station located at the peak of your climb, you can head southward across a pastoral stretch of the island. Finally, you’ll clamber over one final hill before reaching the all-downhill home stretch to a well-deserved finish. Wetsuit and Non-wet suit accepted. The ferry that takes you to the island will leave from either Fullers Terminal, 99 Quay St, Auckland CBD or Marine Square Fullers Terminal in Devonport (note: the Devonport ferr will leave approximately ten minutes after its Auckland counterpart). Included in your race fee will be a ticket for a return ferry back to Auckland from Motutapu (you will have to collect the ticket when you attend the pre-event registration in person). If you would like to join the festivities as a spectator, that's great too! If you have a friend or family member participating in the event, they can purchase a spectator ferry ticket while registering or through a link on their confirmation email. If not, you can go to the Dual's online store (https://www.registernow.com.au/secure/PersonalDetails.aspx) to purchase them for yourself. When it comes to aid stations, our advice is not to rely on them too heavily. While they will still be there, we strongly recommend that you pack your own food, change of clothes, first aid kit, and a minimum of two litres of water. How was Partners Life Dual?